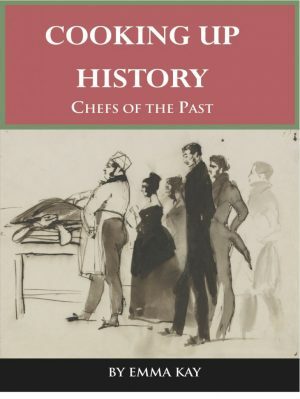 A biographical, historical account of history’s most notorious and celebrated chefs, including Charles Francatelli, Eustache Ude, Eliza Acton, Agnes Marshall. This book is an account of history’s most forgotten cooks, from chefs Louis Eustache Ude, Charles Francatelli and Alexis Soyer, to American cooks. It includes Hercules, George Washington’s black enslaved American chef, George Speck, credited with the invention of the potato chip, Fannie Merritt Farmer of the Boston Cooking-School Cookbook fame, Charles Ranhofer of Delmonico’s, New York, and Amelia Simmons whose American Cookery is the first cookbook on American culture in the kitchen, including the first ‘koekje’ or ‘cookie’ recipe. Emma Kay is the author of two previous books, Dining with the Georgians (2014) and Dining with the Victorians(2015). She runs a kitchen museum called Kitchenalia, and contributes to discussions on food history, with a website, British History of Food, (https://britishhistoryoffood.com) which has a Gallery of Objects, all connected with food preparation. She is a Museum professional with over twenty years experience working at institutions including The National Maritime Museum, The British Museum, and the University of Bath. If you want to learn more about the chefs from our past whose names are bandied around by the likes of Heston Blumenthal, then Cooking Up History is a great place to start.